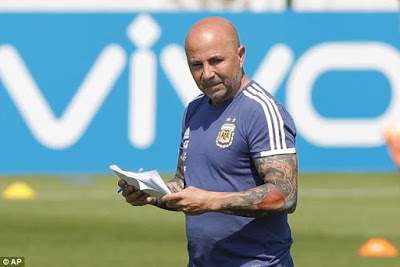 Jorge Sampaoli has inadvertently revealed Argentina's tactical work on the training ground ahead of their critical World Cup showdown with Nigeria next week. Just days after England assistant Steve Holland seemingly leaked their lineup for Sunday's clash with Panama, the South American side almost followed suit. But instead of revealing the XI for the must-win clash in Saint Petersburg on Tuesday, Sampaoli's notebook shows detailed plans from their training camp. 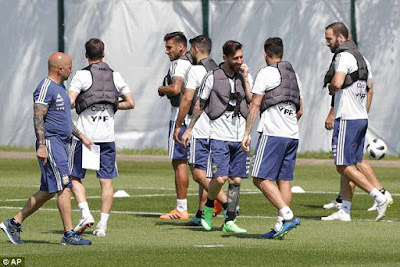 The scribbles on the notebook show two seven-a-side teams lining up against each other in a knockabout in training, with two players, including Lionel Messi, seemingly on substitute rotation. Argentine daily sports magazine Ole also published the pictures, which give a possible indication as to Sampaoli's plans for the do-or-die clash with Nigeria. Having taken just one point from their opening two games, the South American side were on the brink of elimination after a 3-0 loss to Croatia. Nigeria's win over Iceland on Friday has given them a lifeline, however. If they can beat the African outfit and Croatia avoid defeat by Iceland, Sampaoli's side will make it through to the last-16. This incident comes in the wake of the fallout following England's leaked 'lineup' for their second Group G match with Panama on Sunday. Gareth Southgate's assistant Holland was pictured at an open training session carrying what appeared to be the starting XI. Holland apologised to the players for his mistake before training on Friday. 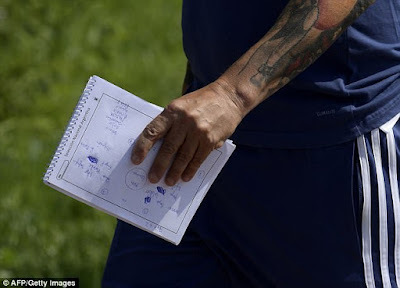 During a training session in Repino on Thursday, which photographers and reporters were permitted to attend, the assistant coach — who is normally the driving force behind trying to keep England's team a secret — was photographed with a notepad that appeared to detail the line-up. But despite his assistant's blunder, Southgate has rebuked sections of the media for publishing the photographs. 'Obviously any time, if we were to give the opposition the opportunity of having our team it's a disadvantage to us. So of course our media has to decide if they want to help the team or not,' he said.